Reni Hofmüller (1966, Innsbruck/AT) is based is Graz/AT. 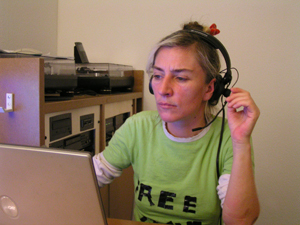 DIY artist, musician, composer, performer, organizer and activist in the fields of usage of (new) media, technology and politics in general, engaged in the development of contemporary art. Co-Initiator/Founder of 42, ESC im LABOR, Radio Helsinki, mur.at, and various other art-related initiatives; part of Eclectic Tech Carnival, member of IMA. 01. 07. 2018: "80/30 - Hommage für Heidi Grundmann"
22. 07. 2018: "The School of Radio presents Cagetown"